A really odd book that doesn't seem quite sure of its purpose; halfway between an encyclopedia and a history text. Organised in a peculiar fashion it lists first a brief history of witchcraft before detailing an extremely curated (but with no hint as to how or why) list of accused and self proclaimed witches... Sarah Goode, Alestair Crowley and Gerald Gardiner are in the same section with little distinction between the two. Finally there seems an attempt at a witch-dictionary, with all these disparate parts cross referenced haphazardly. As other readers have noted it is extremely repetitive and borders on the monotonous. I was disappointed in this book. There is a lot of information here, but so much of it is repeated that the book could have been half the size with a stricter editor's pen. It really felt that every entry was written by a different person, with no idea what was coming before or after their bit.That said, I did learn a few things that I hadn't known before - like an egg tree used to protect against witchcraft. Put a dead bush outside the house, trim down the branches and then cap each one with a blown egg. That would make the neighbours talk! I got a lot out of this book. It does not tell you if witchcraft is real or not, nor it does not tell you how to be a witch. It simply gives you the history of the perceptions of witchcraft throughout history. 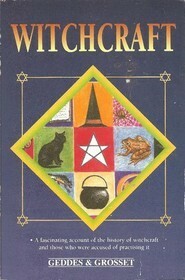 It relates the persecutions, the lives of famous witches, and items and stories related to witches. A very interesting and well written piece of non-fiction. Nice, basic introduction to the history of witchcraft. Did you know that England was a nanny state even during the witch trials? However, the Witchcraft Act wasn't repealed till 1951. Just grabbed it off the library shelf to look through; informational.